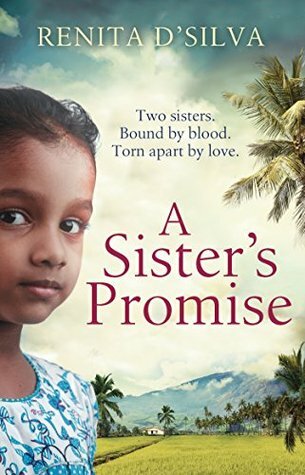 I had read ‘The Forgotten Daughter’ by Renita D’Silva and had loved her writing, so when I saw ‘A Sister’s Promise’ on Netgalley, I absolutely had to request it. Got approved for it, read it and then started this review which sat in my drafts for ages. Sigh. End of the year clean up showes me this and a bunch of others which needed completing. This had to be one of the first to be completed and published, given how much I enjoyed the book. Puja and Sharda are two sisters, who grew up together in India. With personalities like chalk and cheese, they were different but close while growing up. They promised to be with each other, support each other through life, however life had other plans for them. Circumctances forced them apart, far apart. Sharda is living in India with her daughter Khushi while Puja lives in the UK with her son Raj. She has cut off ties with her family, and her son has never been to India, never met his mother’s family. Puja lead an ordered, controlled life in the UK, where emotions had no place. When she receives a phone call from her sister Sharda, her life is turned upside down. She has to make a decision from which there is no turning back. Will she find it in her to honour the promise she made her sister? Will the bond they shared as children be stong enough to bing them together again? Set mainly in India, it resonates with flavours and colours of the place and the emotions that the characters go through. I especially loved the descriptions, be it of the food that Sharda cooks or the emotions, you can almost taste the food and you can feel the pain, the sadness and the joys. Their childhood is so beautifully portrayed. A beautifully narrated story of two sisters, of human emotions that come close to destroying the bond between them, and the strength of emotions and shared lives. I’ve always loved books which transport you to the place where they are set, and this book does that so very beautifully. This is not the first book b Renita D’Silva and will certainly not be the last. I can’t wait to lay my hands on her next book. This is the first year that I’ve not successfully completed the Review Challenge. Given the roller coaster that this year has been, I’ve got to say that I don’t even care. Life takes over, priorities change, hearts are broken, mended, silver linings glimmer in the distance.. and you know that things might never be the same but… But different might not be the end of the world either. And picking up my virtual pen to review one of those 20 odd books which are screaming for a review might just be the way back to my new normalcy. 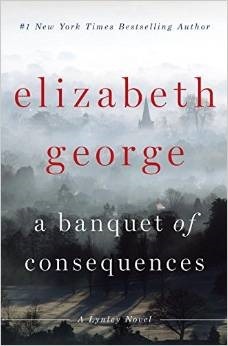 The Banquet of Consequences ( Inspector Lynley #19) by Elizabeth George. I’ve been reading Elizabeth George for about 11 years. It was in 2004 that I read her for the first time and it had me hooked. I can’t remember which one it was but I fell in love with Barbara Havers, the quirky, policewoman. Although these were called Inspector Lynley series, it was all about Barbara for me. So when I saw this book on Netgalley, I had to request it. Barbara Havers is under a cloud. She’s not the favourite person of her boss, Isabelle Ardery, at the moment. It could be argued that she never had been, but this time she had gone just too far. She knows that she has to lie low and do everything to get in the good books of Ardery, even if it means changing the way she dresses. The new docile Havers is a sight which her colleagues and friends find tough to stomach. And when a murder happens, Barbara wants to grab the opportunity to throw herself into the work she does best. Clare Abbott, a well known feminist author is found dead in her hotel room. It was considered a heart attack until investigations revealed that she was actually poisoned. Havers, having run into Abbott a few days ago, is intrigued. Abbott had a rather bossy assistant, Caroline Goldacre. There is something not quite right about Clare and Caroline’s relationship and Havers has her job cut out for her. An murder mystery, with a selection of characters, some charming, some normal, some totally dysfunctional, George, weaves an interesting story. I’ve always liked the flavour that George imparts to her stories, and she doesn’t disappoint in this one either. Some elements of the book felt forced, I would have been happy to have less of Lynley and more of the colourful Dorothea. As a book, I’d recommend it to old fans of the series. It might not work so well as a standalone book if one doesn’t know the background, especially Lynley’s. I think I have missed the last two books in the series, but from what I gather from reviews, I haven’t missed much. So if you are new to the series, I would recommend that you start from the beginning. Susan Elizabeth George is an American author of mystery novels set in Great Britain. Eleven of her novels, featuring her character Inspector Lynley, have been adapted for television by the BBC as The Inspector Lynley Mysteries. She was born in Warren, Ohio, but moved to the San Francisco Bay Area when she was eighteen months old. She was a student of English, receiving a teaching certificate. While teaching English in the public school system, she completed an advanced degree in psychology. Her first published novel was A Great Deliverance in 1988, featuring Thomas Lynley, Lord Asherton, a Scotland Yard inspector of noble birth; Barbara Havers, Lynley’s assistant, from a very working-class background; Lady Helen Clyde, Lynley’s girlfriend and later wife, of noble birth as well; and Lynley’s friends Simon and Deborah St. James.